My teams didn’t have any games this weekend fortunately because the weather in KC was more like winter than fall. I took the extra time I had to start my player evaluations. I spread them out over two weekends so that I can take the time to focus on each player. The way I plan the transition between the fall outdoor season and winter Futsal season indoor is to make sure that my teams don’t play for the first week so that we have time to prepare for the differences in the games. I’ll talk more about how we’re approaching the Futsal season in the coming weeks. Today’s question comes from a long time listener, Cory. His question is about playing against a kick and run style. Cory says, “The U12 boys team I coach has improved quite a bit over last year. We have been working on possession style soccer with emphasis on speed of play. I am most proud of the “way” we are playing and don’t get too focused on the score. More and more, the kids are playing soccer as a beautiful game! Thanks for the question Cory! Playing against a team that plays very direct is often difficult for teams that play a possession style. We are asking our players to have 5 or 10 good passes to work the ball up the field to create a chance to score while the team playing direct doesn’t really even have to connect a pass: they just need kick the ball forward and have our players make one mistake and they can win it back near our goal. If they don’t connect the ball far from their goal so there’s much less danger. If we don’t connect passes we often lose it in our defending third of the field. My suggestion for preparing to play a team with a direct style is to work on bringing balls down out of the air. Start by working on the technique with out pressure then add pressuring players. I like to play an attack vs defense game where the attacking team plays a long ball in behind out defense and then we try to gain possession build up to try and dribble across the half line or score in small goals just the other side of the half line. Since this is similar to the challenges created by a, “Kick and Run” team I think you’ll see a good transfer of training. I also think that you prepare your players for the mental and physical challenge. 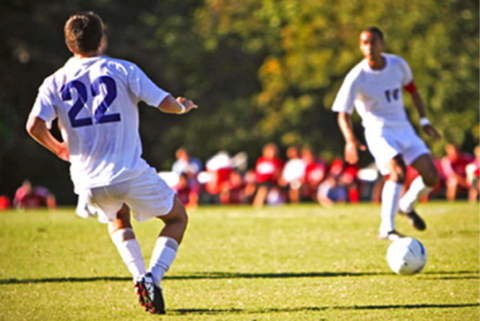 Acknowledge the difficulty that the opponent presents but encourage the players to take it as a challenge. Have a parent count the number of passes your team is able to connect. Good luck and realize that no matter what the score is that in the long term your players are much better off because of how you’re helping them develop into skillful, smart, confident soccer players. Today I describe a change I’ve made to the movement pattern that I use for all of my technical training activities. I believe that it is going to make these activities more realistic, more engaging, more fun and create a better transfer from training to games. Here’s a video that shows the way I’ve changed the movement patterns in my technical training activities. I’ll be taking next week off from the podcast while I celebrate Thanksgiving with my family. I’ll be back in two weeks with a new episode that will most likely focus on the work I’ve been doing with my team to prepare for the winter Futsal season. As to Cory’s inquiry, I was excited for your response as its a situation my team is facing as well. U14 boys and opposing coaches are placing their biggest, fasted kids at striker. Team after team is playing incredibly direct, with no effort to possess and build. Half my team is playing up a year, so we physically don’t match up well at this point. I was hoping for a little more consideration to the defensive side of the situation in the pod. How do you defend the kick and run? Defensive awareness of the impending attack, hoping your defenders will recognize the situation and drop early to snub out the attack? Immediate pressure on the ball to try to prevent the long outlet? I’m sorry, I should have talked more about how you can defend against this style of play as well. I want my forwards to pressure the ball whenever we lose it so that their players have a tough time just clearing the ball up the field. There are times when we can’t get pressure to the ball quickly enough so our defenders need to recognize this. If we have pressure on the ball our defenders should step up and mark there attackers tightly. If there players have time to lift their head and look then we need to start dropping deeper in preparation for a long ball. I would work on this in an attack v defense situation as I described earlier but now we would have the play start with a turn over by the attacking team. Then we try to pressure the ball and the backline reacts accordingly. Great episode. I have often struggled with the “Follow Your Pass” activities. I coach a U9/10 girls club team. I must admit that I struggle greatly with trying technical activities like you describe in this episode. Even when there is the proper amount of kids in an activity like this (5-6), my kids just seemed to be bored with it. They would much rather prefer to play something with a competitive element. Perhaps 7-9 year old girls are too young for this type of activity? Any suggestions you could give to engage young kids in technical activities like this would be greatly appreciated. Thanks, I’m glad you enjoyed the episode. You can make these types of activities competitive by having two groups compete to see which group can get five rotations down first. If you have one group you can challenge them to complete a certain number of rotations in a given amount of time.